In this chapter, we will utilize AMOVA to analyze our populations. AMOVA stands for Analysis of MOlecular VAriance and is a method to detect population differentiation utilizing molecular markers (Excoffier, Smouse & Quattro, 1992). This procedure was initially implemented for DNA haplotypes, but applies to any marker system. The implementation of AMOVA in poppr requires two very basic components: (1) A distance matrix derived from the data and (2) a separate table used to partition the data into different stratifications. To calculate AMOVA in poppr, one simply needs to supply a data set with stratifications. We will use the Aphanomyces euteiches data set from (Grünwald & Hoheisel, 2006). In this example, we have a data set of 187 individuals sampled from two fields located in Athena or Mt. Vernon over 8 or 10 different soil samples within each field. We want to see if most of the variance is observed at the sample, field, or regional level. In panmictic populations, we would expect to see most of the variance arise from within samples. 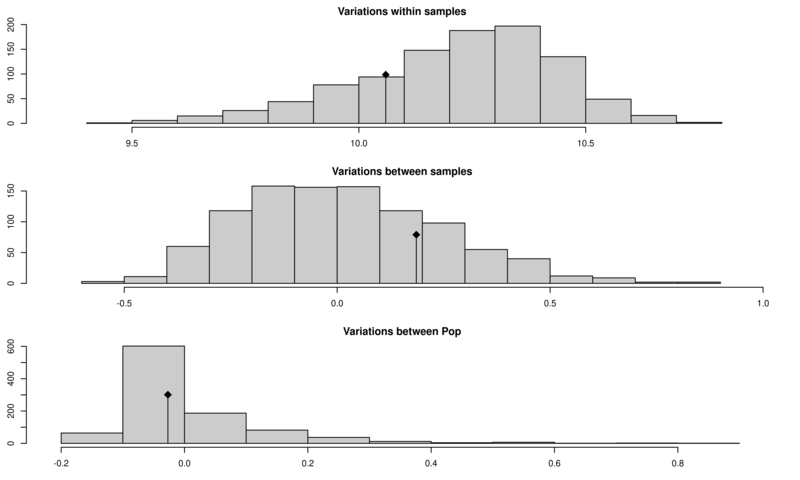 If we see that the most of the variance occurs among samples within populations or among populations, then there is evidence that we have some sort of population structure. In the case of clonal organisms, this would help support a hypothesis of clonal reproduction. Since Aphanomyces eutieches is known to be clonal, we would not expect most of the variance to come from within samples. We’ll look at the AMOVA results for both analyses. The first thing to look at are the $results element. The degrees of freedom (the Df column) should match what we expect from our (not clone-corrected) data. The number in the Total row should equal 186 or \(N - 1\), where values are calculated from pooled data. Note that here, “samples” actually refers to subpopulations since we cannot asses within-sample variance of dominant data. The $componentsofcovariance table shows how much variance is detected at each stratification. We expect variations within samples to give the greatest amount of variation for populations that are not significantly differentiated. Sigma represents the variance, \(\sigma\), for each hierarchical level and to the right is the percent of the total. Finally, $statphi provides the \(\phi\) population differentiation statistics. These are used to test hypotheses about population differentiation. We would expect a higher \(\phi\) statistic to represent a higher amount of differentiation. 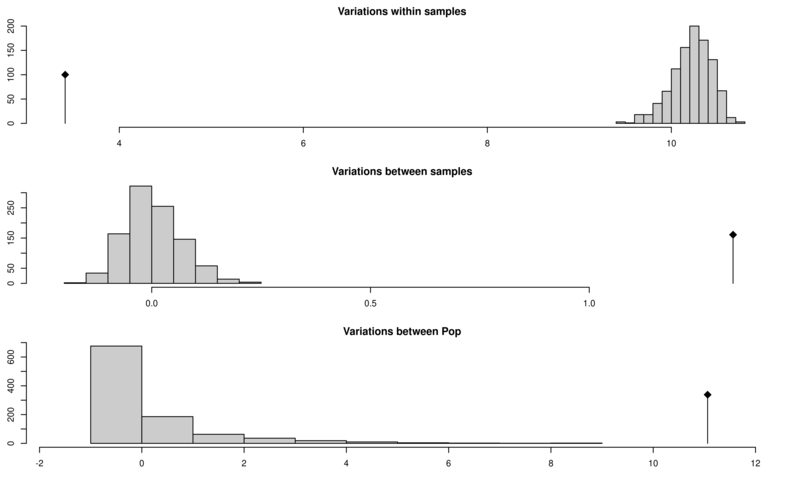 To test if populations are significantly different, we perform a randomization test using the function randtest() from the ade4 package. This will randomly permute the sample matrices as described in (Excoffier et al., 1992). The above graphs show significant population differentiation at all levels given that the observed \(\phi\) does not fall within the distribution expected from the permutation. Compare the results of our AMOVA analysis to those published in (Grünwald & Hoheisel, 2006). They should be identical. Here we see that the populations are completely shuffled, so in the next step, we will reassign the strata with these newly shuffled populations and rerun the AMOVA analysis. We see that there now is no significant population structure. AMOVA is a powerful tool that can help support hypotheses of population structure due to clonal reproduction or isolation without making assumptions about Hardy-Weinberg equilibrium. We have shown that we can reject the \(H_o\) of random mating between the two populations and have strong evidence that these populations are significantly differentiated at all stratifications (Grünwald & Hoheisel, 2006). From these results, we can investigate hypotheses as to why these populations are significantly differentiated. This example was performed with a data set of dominant (AFLP) markers, but it can also be performed on codominant markers such as SNPs or SSRs. 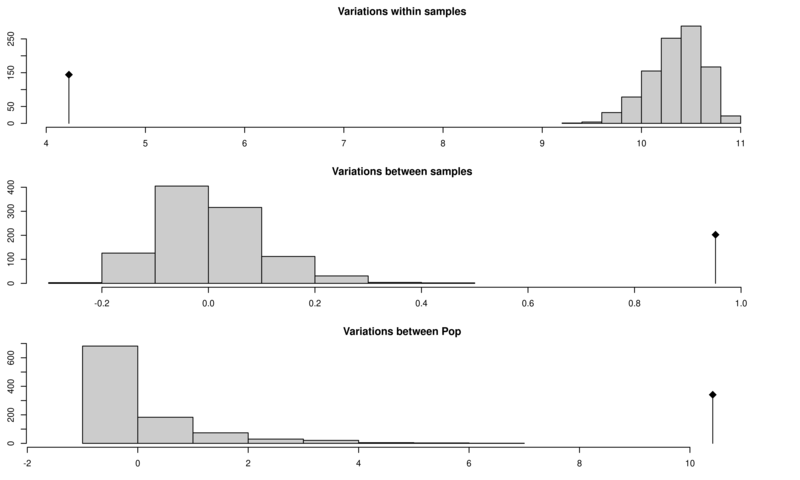 These provide more information because within sample (individual) variance is also assessed. If one wants to utilize a genetic distance that has biological relevance, a different distance matrix can be chosen. See help('amova', package = 'poppr') for more details.